With the successful launch of three new additions to the independent marketplace over the Summer, Fusion has expertly partnered with advisor teams to handle project management for the transition of nearly $4B of AUM year to date! 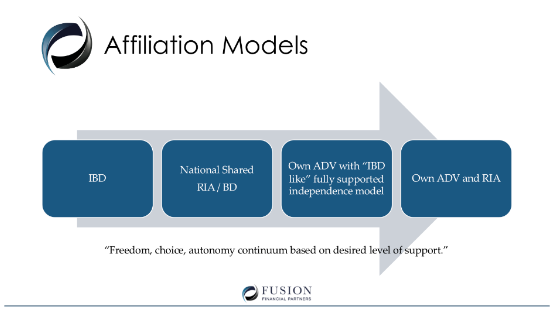 Our focus remains in support of the fiduciary movement and supporting advisor teams in their pursuit of upgrading the environment to best serve their clients and tapping into the freedom, choice, and autonomy that independence delivers. We also recognize that no two advisors are the same and there is not one flavor of independence that works for everyone. Educating our clients on the spectrum of affiliation models is one of the first steps of our engagement with teams. Whether you are seeking to join a national firm, are in need of hybrid solutions or desire to launch of your own RIA, this education process is vital to building a foundation of understanding for our clients. Advisors are empowered by harnessing our proven experience and insider knowledge providing the pros and cons of each affiliation model, as well as, the related economic analysis. Just as importantly, we are often times tasked to work with advisor teams to bring forward their connectivity with their team members. This scientific work involves identifying and working in the important pillars of functional organization: accountability structure, enhance communication, and alignment to the owners’ vision– all critical pillars to build upon and increase the level of confidence when executing change. As demonstrated in the visual above, as you move through the stages of greater independence, you gain greater choice and autonomy, that also increases your internal operating responsibilities. It is important to understand the details of each of these model options to find the best affiliation for you. For more information on RIA Launch and other services available to Wealth Advisors, visit our website. Contact: Megan Hausmann, 760-889-8141, mhausmann@fusionfinancialpartners.com. 2019 is the Year of the RIA!